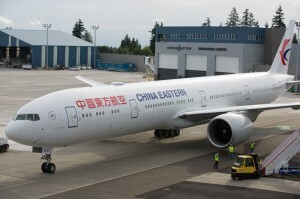 China Eastern Airlines formally unveiled its new visual identity Wednesday evening via its first Boeing 777-300ER. The new branding, which features substantial changes to both its livery and logo, intends to shed perceptions of a staid state-owned carrier and instead present a modern, international image. 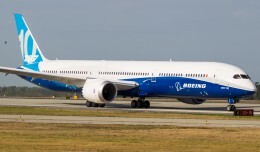 The addition of the 777, meanwhile, will position the carrier to be more competitive in the trans-Pacific market. A traditional Chinese dragon stands beside China Eastern’s new 777-300ER. 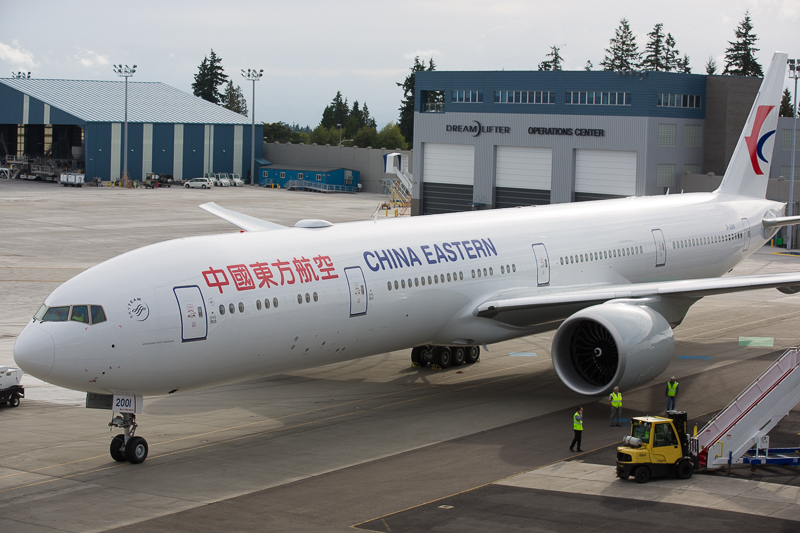 The jet is the first of 20 Boeing 777-300ERs that the Shanghai-based carrier expects to receive through 2018. In addition to today’s delivery, four more are due by the end of the year. The order was initially placed in 2012. China Eastern will outfit each aircraft with a three cabin configuration. First Class will seat six suites with a unique configuration. The first row will be 1-1, separated by an enormous bar area in the center. The second row will be laid out 1-2-1, with the middle block of suites able to merge in one large “love” suite. Each seat features large display screens, 80 inches of pitch, sliding doors, and full-flat capability. 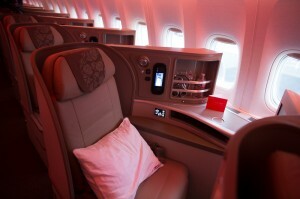 Business Class is also in a 1-2-1 layout seating 52 across two cabins. The airline is utilizing the extremely popular Zodiac Cirrus reverse herringbone product. Each seat will feature 46 inches of pitch, power ports, pop-out display screen, and full-flat capability. The product is the same as regional competitor EVA Air, based out of Taiwan. 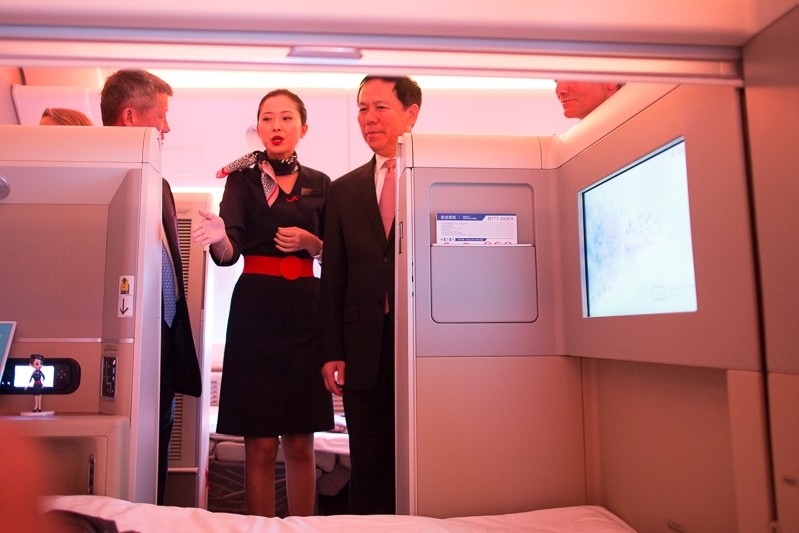 There are also two Economy Class cabins, which will seat a total of 258 passengers. Each Economy Class seat will have 32-33 inches of pitch. 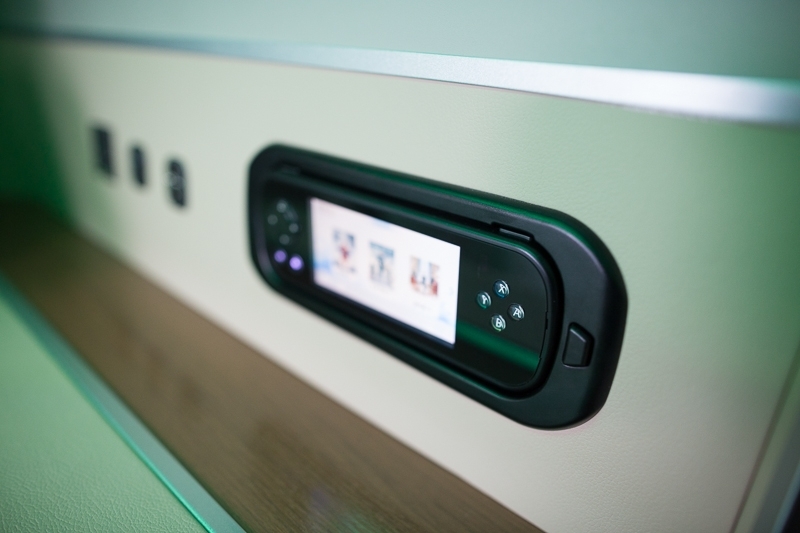 Panasonic’s eX3 in-flight entertainment system, with touchscreens and USB ports at each seat, is installed throughout the plane. The airplane will also be the first in China to utilize in-flight WiFi from Panasonic. The jets will be deployed to New York and Los Angeles starting in November 2014. 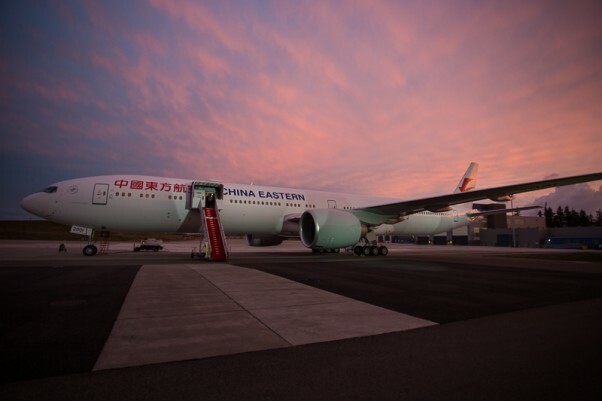 China Eastern executives say they wish to place the jet on existing service to Honolulu, San Francisco, Toronto, and Vancouver down the road, adding that it is seeking to boost frequencies. New service to other North American markets is to be expected the carrier says, though the airline remained silent on exactly what those destinations might be. 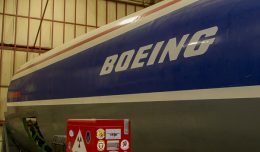 It also plans to use the jets to bolster service and expand into new destinations. 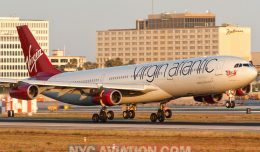 The new airplanes will also allow the carrier to retire its aging fleet of Airbus A340-600s. The airline says it intends to phase out the jets by the end of 2015. 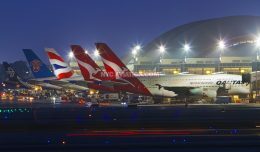 The jets have placed China Eastern at a bit of a disadvantage in the region as more and more carriers have ditched four-engined A340s and 747s for fuel-efficient twinjets such as the Airbus A330 and Boeing 777 and 787. China Eastern chose the occasion of this first delivery to display the transformation of its livery, which was first announced earlier this month. While the new graphics have been available for some time, the new look manages to be even more dramatic in person. Gone is the retro-looking tricolor cheatline. 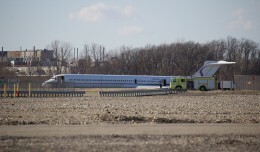 It has been replaced by an unapologetically monotone white fuselage, which is broken up only by the company name. The swallow logo, formerly encased in a blue and red circle on the tail, now stands on its own: one part in red, the other blue. Also gone are the hard edges and points, replaced by rounded edges and a more circular design. The carrier’s identity overhaul is the first such change since it began operations in 1988. 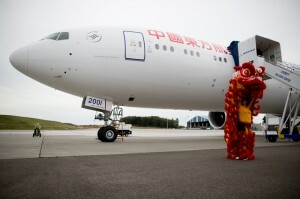 It is notable as well that the airline is the only one of three state carriers – Air China and China Southern being the other two – that has thus far managed to effect radical change in its customer-facing corporate identity while operating under the slow-moving, heavy-handed influence of their majority owners. Jeremy Dwyer-Lindgren is a Seattle-based freelance photojournalist and aviation writer. He can be reached via email, or you can follow him on Twitter.